An attic stair — which is actually more of a ladder — is a fairly simple apparatus consisting of a folding series of steps attached to a door. The door usually is counterbalanced to the ceiling with folding steel arms and two heavy-duty springs. If the springs are worn, rusted, loose, or broken, the integrity of the entire device is seriously compromised and an immediate repair is necessary. The repair is extremely simple, in many cases only requiring a wrench or screwdriver and a partner. Repairing an attic ladder spring is simple. Climb up into the attic. The springs are most relaxed when the attic ladder is in the stowed position. If the springs are in bad shape, it may be wise to use a stepladder instead of the attic ladder to climb up. Shut the attic door once you and your partner are in the attic. Inspect the brackets at the door hinge where the springs attach to the attic door frame. If they are loose, tighten them up as much as possible, using either a wrench or screwdriver (depending on your attic ladder model's attachment type). Put on your work gloves and grab one of the springs in the middle. Pull toward either end of the spring. While pulling, have your partner use the screwdriver to gently pull the hooked end of the spring out of the ring it is attached to. Repeat this step for the other spring if both need replacing. Take the replacement spring(s) and hook one end into the ring on the bracketed end. Pull the opposite end so that you are able to hook it onto the folding metal arm. Repeat for the other side if necessary. 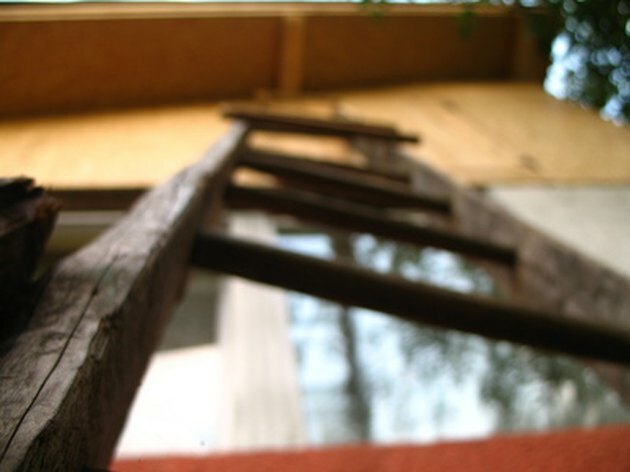 Your attic ladder should be counterbalanced again, just as if it were new.